This is a case study that describes how Kanban and lean development techniques were used to rescue a distressed project. This particular project was a custom development project for a large client that had been in progress for about a year. The development team fluctuated in size from 10-15 team members. The team started off the project using a typical waterfall development model. An analysis phase preceded the development phase. The analysis phase was supposed to take 2-3 months but ran over that time. During the analysis phase the scope began to grow beyond the initial understanding of both the client and the development team. Because the client insisted on getting the requirements "nailed down" and "signed off on" the analysis phase ended up taking about 6 months, which is roughly a 100% schedule overrun. Despite the fact that the analysis phase ran over the originally planned time, the project end dates were not pushed out to align with that reality. As a result, the development team was pressured to deliver more-than-anticipated functionality in a less-than-anticipated time frame. The development deadlines were missed, and since testing was bolted on at the tail end and compressed, the quality of the developed solution was inadequate. The development team operated in an interrupt-driven manner because the project manager did not manage the client to protect the development team from distractions. The typical pattern was that the client would yell at her about the quality issues and then she would just pass that through to the development team. So whatever was the crisis of the moment was what received the attention. The development team was never able to focus on a problem and drive it to completion before the next problem interrupted their work. By the time I got involved, the relationship between the client and the development team was damaged and the client was refusing to pay. The solution was unusable by their users from functionality, reliability, and performance standpoints. The project had run over budget by hundreds of thousands of dollars. The schedule was blown by months. Neither the client nor the development team could afford the fallout of a failed project, so it had to be turned around. The first thing to do when confronted with this type of situation is don't panic. In this particular case, the client was very agitated and had zero confidence in the team. The client was blaming the team and the team was blaming the client. Morale was poor, and it was getting worse because management was demanding that the team work harder to fix the problems. One of the worst things you can do is to dig your heels in and keep doing more of what got you in the situation in the first place. Experience has shown that the best way to start removing the emotion from these types of situations is to work with the data and facts. It is important to understand the root causes of how the situation arose in order to best craft the path forward, but initially it is not helpful to present the team with all the things they should have done differently. That only inflames the situation further. In this particular case, the main fact was that the product quality was terrible. The number of reported defects supported this. We had to get the product to a point where the users could actually do their jobs. And the only way we could start to do that was to create the environment for the development team to be able to focus on one problem at a time. It seems strange to think that despite all the advancements in software development we need to keep re-emphasizing the importance of building software that actually works correctly. Yet this is one of the main areas where software projects continue to be challenged. In the earlier part of the project, the development team spent months trying to document in great detail what they thought the client wanted. This led to the false sense of security that they (and the client) knew for sure what they were going to deliver in the end. In addition, the only team members that were engaged with the client in the analysis phase were the analysts. The developers were not brought onto the team until the requirements were "done". The developers had to digest and interpret the requirements as part of a 200-300-page document as an atomic unit. The client continued to make changes to the requirements even after the analysis document was "signed off" by both parties, which meant that the developers' work was continuously being invalidated. This caused the development to push out beyond the originally planned development completion dates. Testing happened at the very end after all the development was "done". Since the original deadlines had passed, this meant that testing had to happen in a hurry. Quality was less a measure of whether the developed software worked correctly and more a measure of how frequently testers and developers interpreted the requirements the same way. The ultimate result of all this was that many hundreds of defects escaped development and made their way in front of the client. Defects are the worst kind of waste because they are unimplemented requirements for software that has been developed already. This means the client pays for software to be developed and then they (or the development team) have to eat the cost of making it work correctly. Clearly the way the development team was working did not put quality first. In fact, it put quality dead last. Since analysts, developers, and testers were matrixed onto the project to do their specific tasks they never really learned how to work as a cohesive unit that felt collective responsibility and ownership of the system quality. When problems arose they pointed the finger at one another. In short, they had failed to develop and embrace a culture of quality. The single most important decision we made to start getting control over quality was to require acceptance tests to be developed for work items before a developer could write code. This is called Acceptance Test Driven Development (ATDD). With ATDD, we literally put quality first. The way we made ATDD work on this project was that we required a set of acceptance tests to be associated with each work item in the backlog. This effectively documented the requirements that were unsatisfied by the developed code. It also forced the tester and developer to get on the same page before coding started. 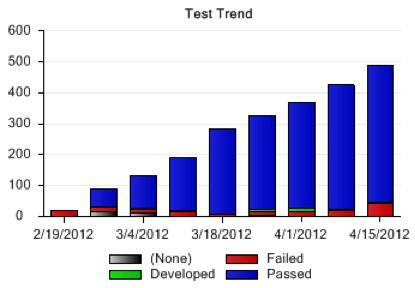 The developers' job became focused on making the failing acceptance tests pass. It is important to clarify that tests were developed on a work item by work item basis, not for a batch of work items at a time. This approach takes the guesswork out of whether the developed code works properly or not. The test either passes or fails. Yes or no. True or false. Since each developer focused on one work item, the number of acceptance tests the developer had to understand at a point in time was never too many as compared with having to understand the entire analysis document up front. Failed. The test initially fails because code has not been developed to make the test pass. Developed. The code to make the test pass has been developed. The developer identifies this transition as they implement the code. Passed. The testers have verified that the developed code does in fact make the test pass. Using the ATDD approach alone had the most positive transformative effect on product quality. In the first 8 weeks of using ATDD, we transformed the project form one that had no documented test coverage to one that had a library of tests and a documented history of passing tests that asserted the overall quality of the code being developed. As mentioned, the development team started off working in a waterfall approach. However, things ended up breaking down into an ad-hoc approach once development began and the big-up-front-requirements document became invalidated by uncontrolled change. From there, it didn't take long for the line from the code back to the requirements to become blurred and then eventually erased. The profile of the work assignment was a classic push system with a very large batch size. The development team was pushed a large requirements artifact from the analysis team. The test team was pushed a large code base by the development team plus the very large requirements artifact from the analysis team. During testing, when defects were uncovered, they were pushed to specific developers by a manager. When the fixes were made, a manager pushed them to specific testers for verification. This approach resulted in a lot of waste. In the analysis phase, a vast amount of unimplemented requirements accumulated. In the development phase, a vast amount of untested code was developed. In the test phase, a vast amount of unimplemented and improperly implemented requirements were identified. A large number of defects escaped development and made their way in front of the client. The origins of this phenomenon can be traced back in large degree to the batch size that the team was working with. The team simply did not have the capacity to move the entire batch forward as a unit in the timeframe in a way that maintained the integrity of the unit as a whole. Trying to move such large work products forward resulted in each team becoming a bottleneck on the team that needed to perform the subsequent tasks. In the end, it became a Sisyphean task that ended up sending the work products collapsing backwards from testing to development to analysis. And the process kept repeating. In other words, all the work done up front getting the requirements "locked down" was complete waste because once defects emerged, the team had to keep asking themselves "now what was this supposed to do?" Even having to ask that question is wasteful. Breaking the destructive cycle and getting the team to a state where they could actually close work items and keep them closed meant changing the team structure and fundamentally altering the way that the team moved work items from Pending to Done. In fact, it meant changing their definition of the work "done". The fact that the team members did not share a common sense of ownership of the solution was a major impediment. The first thing we did was to dissolve the matrix organization. Analysts, testers, and developers were now just part of the development team. Along with this was directly setting the expectation that it was their collective responsibility to deliver a quality product and that they all owned quality - not just the testers. We also physically co-located all the team members in a large conference room. This further reinforced the fact that they were a single team with shared purpose. It also meant that now they had to actually talk to one another instead of emailing each other from one cubicle to another. The next thing we did was to remove tasking authority from the project managers. That is, managers could no longer push work to the team. As mentioned, the team was operating in an interrupt-driven mode, wherein a manager would task team members in an ad-hoc manner, which resulted in a low probability that the previous task actually got completed. To put some structure to the development effort and seal the exits on defects escaping development, we introduced a pull system using Kanban. The Kanban approach forced the team to work with smaller batch sizes. Initially, this was easy because the all of the work items that needed to be completed were defects, which are usually pretty small to begin with. It also forced us to define the word "done". With this approach, work items (depicted as cards) made their way from left-to-right on a Kanban board through a series of states (depicted as columns) starting with Pending and ending with Accepted. Whenever a card was ready to be worked on a team member would pull it into the next column, which meant they were working on it. Team members had to apply their particular skill at the right places to keep the cards flowing. A work item was not "done" until it has passed through each of these states and ended up in the Accepted state. Done = Accepted. Each column represents work that needs to be done to move the card forward. In order to decrease coordination costs related to communication of completed tasks, we added ready states to indicate that the previous task was completed and now the next task is ready to be performed. For example, when the acceptance tests have been developed, the work item is ready to develop code. So the Kanban board provides a simple visual mechanism that encapsulates the process that a work item needs to go through. It also provides a way to see the status of in progress work items at a glance. The columns on our Kanban board are listed below. Note that the first task for each work item is to define the acceptance tests as described above. In many cases a Kanban board can be drawn on a wall and the work items can be represented with sticky notes. In our case, the team was geographically distributed, and I wanted to make sure that we were constantly relying on the captured metrics to make more informed decisions about how to keep making the process better. We chose VersionOne as our Agile project management tool. One of the most valuable tools that we used was the cumulative flow chart. This chart allowed us to look at the composition of work to see how the work items were trending towards Accepted. Since we were promoting builds to the client on a weekly basis, we could track the composition of work on a weekly basis. We could also view the cumulative flow in the aggregate across many weeks to understand broader trends. The above chart shows the cumulative flow of work items over the eight-week period that we were turning the project around. Each of the stacked bars on the above chart is the aggregated view of the following charts on a weekly basis. These charts are the ones we looked at on a daily basis to see if we were on track to close work items for the week. We found that having a visual mechanism like this was much more helpful for the team than simply looking at lists of defects in spreadsheets like they did previously. We also introduced work-in-process (WIP) limits to control the pace at which work items could work their way through the Kanban states. We observed that the analysts were not able to produce acceptance tests at a rate that kept pace with the developers. Since the developers could not keep working on new development tasks without violating the downstream WIP limits, the analysts became a bottleneck in the system. This forced the team to work together to figure out how to even out the distribution of work to ensure a consistent flow of work items. Sometimes developers had to write and verify acceptance tests (not for their own development work). We had to add more analysts and testers to the team. In some cases we adjusted the WIP limits to work out unnatural wait states. Ultimately, the team had to start working as a real team. They had to learn how to think about how to make the work items flow through the Kanban system. This caused a big boost in morale, and the team began to own the quality of the result as a team instead of pointing the finger at each other when they were simply matrixed onto the project to perform some specialized skill and then go back to the resource pool. Once we solved the problem of how to move work through the Kanban system, we had to get work items into the backlog and estimated so that the team could just pull the next work item with minimal interruptions. Previously, the development team was simply told what work items to work on and when they were to be completed. In addition to the problems associated with the aforementioned interrupt-driven tasking model, developers never took the deadlines seriously because they had no ownership of the work item estimates. The project manager making the commitments to the client had no real understanding of how long it would really take to complete the work items so they just told the client what they wanted to hear. This resulted in deadlines that were rarely met. Eventually the project manager had lost all credibility with the development team and the client. By declaring everything an emergency, the PM ended up creating an environment where nothing really ended up getting treated with any urgency. In Agile approaches, it is essential that the team doing the work perform the task of estimating the work it is being asked to do. Therefore, we had to also ensure that the estimation task itself caused minimal interruption of the development tasks. If everything is important, nothing is. One of the keys to making a continuous flow, pull system like Kanban work is for everyone on the team to have a consistent understanding of what the next most important work item is. If everyone knows what work item to pull onto the board next, the team does not need to continuously absorb the coordination cost of figuring out what to do next. The central mechanism for managing the full list of candidate work items is the backlog. The backlog is a prioritized list of all the potential work items that have been identified by the product owner and users. User stories and defects are kinds of work items. Users and other stakeholders can request a new work item at any point in time. When they do, those requests just go into the backlog. Addition of work items to the backlog will have no impact on the work that is currently being completed on the Kanban board. Rather, the backlog is a holding place for requested work items. New work item requests simply represent a commitment on the part of the development team to have a conversation about the requested change with the requester. All work items in the backlog are prioritized relative to one another. So the work item at the top of the backlog is the one that has been deemed the next most important thing for the team to work on. If the product owner cares about the order in which work items need to be completed, they must play an active role to ensure that the backlog is properly prioritized. By the way, the relative priority of work items is constantly changing in response to changing business needs. Previously, I mentioned that we revoked the development team manager’s ability to task developers. We re-purposed the PM role to one of working closely with the client to force them to prioritize the work in the backlog. And yes, they had to be forced to do this since up until that point, they were accustomed to controlling what the team worked on by throwing a tantrum, which in turn exacerbated the interrupts on the development side. This ended up being a full-time job for the manager based on the large number of backlog items and the rate at which the client kept changing their mind about what they wanted next. One of the rules we put in place was that a work item could not make its way from the backlog onto the Kanban board until it had been estimated. The reason for this was so we would not compromise our ability to report on the velocity of the team, which fed into our ability to make future commitments, based on the prior performance of the team. Every Monday morning, we held an hour-long (time-boxed) estimation session for the team to collectively estimate the highest priority backlog items that had not yet been estimated. The team estimated as many items as they could in that time period. The estimation units were ideal days. The estimates accounted for all the activities on the Kanban board. Previously, what few estimates were done only took the actual coding into account. By having the entire team do the estimates, they all felt more vested in delivery of the items within the estimated time periods. Since all the development activities were included in estimate it also forced them to understand more about what was involved in their teammates' roles. It increased their cohesion as a team. By doing the estimation session at the beginning of the work week, we could get it over with and out of the way so the team could focus on delivery for the rest of the week and not be interrupted to do estimating when they needed to be doing development. We observed that there is a dynamical relationship between prioritization and estimation because the product owner may choose to increase or decrease the prioritization of work items based on how quickly or not they can be completed. For example, a user story that the client thought was a high priority may end up not being as important once the client learns that they can get four of five smaller stories done in the same time-frame. Projects get off track for a variety of reasons. Projects that start off using traditional, predictive planning approaches are more susceptible to derailment. This article has presented a high-level approach for containing projects that have become distressed. Some of the methods may seem counter-intuitive such as embracing change instead of trying to control it. The idea of letting the development team pull the next batch of work instead of pushing it to them may seem strange to some. Using the approaches in this case study we were able to turn this particular project around from one that was on the brink of failure to one where the client was very happy with the quality software of they were receiving and the predictability with which it was delivered. We started seeing positive results in the first 2-3 weeks. After 8 weeks, the root causes of all the dysfunction on the team had been completely addressed and the team became largely self-sufficient and self-managing. Equally important, the morale of the development team improved significantly. After years of being beaten down by a barrage of unmanaged interrupts and complaints about the quality of their work they were finally given the chance to prove to the client and themselves that they, in fact, did know what they were doing and could produce a worthy product. The development team now uses the Kanban approach for all of its development projects. It allows them to more effectively set client expectations up front and deliver predictably on commitments. Kanban is not merely a project recovery tool. The best way to keep a project from needing to be bailed out is to employ these methods from the beginning. Steve Andrews is the founder of Fountainhead Solutions, LLC. His vision was to create a company focused on developing innovative software solutions using Agile methods and contemporary engineering techniques. Mr. Andrews has an extensive background as a leader of solution development initiatives for almost 20 years. He is an expert in finding ways to maximize the effectiveness of teams to develop working solutions for challenging problems as quickly and cost-effectively as possible while also improving the lives of developers and users alike. Mr. Andrews holds BS degrees in Computer Science and Mathematics from Vanderbilt University. Is this a real world case? Re: Is this a real world case? Little: At one point you say "We also physically co-located all the team members in a large conference room." then later you say " In our case, the team was geographically distributed." Huh? Big: What was the people side of this? There must have been team members who bought in and led, and management that supported. What happened there? Seem like we need another long article on just that aspect. Little: Sorry for the confusion. We physically co-located all the folks from the Northern Virginia office into a large conference room. These 10-12 folks comprised the nucleus of the team. The end client was in the UK, and there were three developers in India that obviously couldn't be in the room with us, which is the main reason why we needed to use the VersionOne tool. Big: Leadership of the company brought me in to fix this project. They had to accept that the PM they had originally placed in charge was not the same person that could pull the project out of the fire. The rest of the team was left in place. They also had to accept that the entire methodology they traditionally used to run projects was not sufficient. From the outset of the recovery effort, company leadership came in and admitted they had not given the team the tools they needed to succeed. I was given all the empowerment that I needed, and management agreed to stay out of the way. You are correct that this is a very involved topic in itself, and it has to do with establishing the initial conditions for project success. It involves a lot of tough, adult conversations and a willingness to let go of failed ways of working, and many companies are never able to get to that point. Thank you Steve for a great article. It is very interesting and inspiring. I keep top management technical position in my organization. I am more and more convinced that we have to switch to Agile culture in order to meet our goals and improve many things we have problem with. I've read many articles, listen to many lectures and read a few books on the Agile culture and methods. I miss one major thing -- what is top management role in the process to switching to Agile? What is best way to lead the change? It is also always presented in way that once you have Agile process it just work by itself and top management can relax and enjoy the ride. I somehow don't believe that it is so simple. What is your view on a top management role? How different it is from non-Agile developer organization management? Great question. I'll be as brief as I can with an answer. The role of top management is to establish the conditions and environment to enable sustained business viability for their company. This means structuring the organization, hiring the right people, and putting the right processes in place. In order to achieve sustained success, a business needs to constantly adapt to changing customer and business environment demands. Upper management has to have a finger on the pulse of what the business target is and continuously be challenging staff to meet those demands. While upper management has to establish the initial environment, they also have to figure out how to empower their employees so they can figure out how to best self-organize to keep adapting to the ever-changing business needs. Right now lean and agile methods seem to be the best methods for software organizations to validate customer needs and continuously adapt and improve. Upper management actually has a tough job in enabling lean and agile projects, because they have to be assertive on the vision but nurture and enable their teams so they can execute the vision. Too much assertiveness on the execution side and they are micro-managing. Not enough and they are asleep at the wheel. It's a tough balancing act. At a minimum, I'd say management needs to be educated on the Agile metrics so they can be plugged into the leading indicators of potential issues and intervene when necessary, but be able to step back and let teams do their thing when things are moving in the right direction. They should also be active participants in Agile ceremonies such as retrospectives so they are aware of what their teams need. One other thing that upper management has to have is patience and faith in their people. Bootstrapping Agile approaches and ingraining them in the culture takes time. Management can't just pull the rug out from under the team and revert to non-Agile methods just because their are emergencies or hiccups along the way. Neither can they let their teams lose discipline and focus. I don't know there is much difference between the high-level responsibilities of top management in Agile and non-Agile companies. But I do think that Agile provides the tools that will help management be more attuned to the real-time health of the projects in their portfolios. This topic may actually warrant an entire article on its own as Chris suggested in his comment. Great article on a very good transitional case. I prefer "the analysis process became a bottleneck in the system" instead of "...the analysts became a bottleneck in the system". If you put the problem on the shoulders of people may favor the emotional resistance raising. Enjoyed your article, and very much agree with your findings. Have you used Scrum? Do do you prefer Kanban, or are there particular types of projects for which one or the other approach is best suited? I can’t agree more on your statement “The single most important decision we made to start getting control over quality was to require acceptance tests to be developed for work items before a developer could write code…It also forced the tester and developer to get on the same page before coding started”. It seems that ATDD is very effective regardless of whether you are doing Kanban, Scrum or only Water-Scrum-Fall (what we are practicing). Especially with language like Gherkin that business users can understand, users, developers and testers are on the same page. In the past, users tend to throw out casual and not well thought through requirements. They now become very caution if they can provide valid acceptance tests cases. This saved us a lot of rework. Serving as both specifications and automated regression tests, it is worthwhile to maintain these acceptance tests as our living document throughout the system’s life span. We even plan to run full regression tests after applying patches and upgrading OS and components in servers. I hope that there are more real life experiences sharing in using ATDD. A pool of prioritized requirements is good. But if these are packaged up into jobs, the only design that will be taking place will be at the micro level or it won't be on the radar. Given that an understanding of the design of the artifact is central to quality work and a quality product, I am guessing that you used frameworks heavily. I would think about a double-dispatch between pending and designed job, the priorities still apply but it encourages developers to bring their brain to work (which is why they signed up, right?). Likewise refactoring tasks etc can thereby stay off the pending queue and yet remain visible. Nice and simple. KISS is what you need in a crisis. Good job and thanks for reporting on it. I have used Scrum on several projects as well. I have found that Scrum can work really well for up to 7-9 person, physically co-located teams. While Kanban controls WIP based on the state of work items (In Development, Pending Acceptance, etc), Scrum controls WIP at the iteration level. For example, in Scrum the WIP is to a large degree a function of the scope the team commits to based on their historical velocity. Because of this, Scrum teams tend to be more disciplined in terms of being able to work together to make sure they are ensuring the right balance between focusing on a specific story versus multi-tasking across stories to be able to ensure that the sprint commitments get met by the end of the sprint. By contrast, Kanban takes the guesswork out of this - the stories are flowing across the board unimpeded or there they are getting backed up in some work item state because of some bottleneck and the team needs to organize to unblock the bottleneck. Kanban does a good job of quickly radiating the information about work items being blocked because some WIP constraint is violated. That said, adept Scrum teams can be equally adept at staying unblocked through constant communication and collaboration, which is why I think it works better for physically co-located teams. For example, if I'm a tester and I need a developer to start working on a story I just developed tests for, it's a lot easier and more effective for me to swivel my chair and tell the developers in the room with me than it is to send an email and wait for a response. Scrum sprints provide nice time boxes that can be used to plan incremental chunks of functionality that roll up to a release. Sprint boundaries also provide a great place for the team to retrospect about how they are working and make continual improvements. The cadences of regular Release, Sprint, and Standup ceremonies provide great sync-points for the team to come together in a way that has low coordination costs. In Kanban, you can still achieve this, but its just not baked into the methodology - you keep working until you think you have enough and then do a release. One other thing to consider is that Kanban is a good transitional approach because it is very accommodating to existing ways of working, but it just decreases the batch size and enforces WIP constraints to govern the throughput. Switching to a Scrum approach, however, can be more disruptive because it requires the team to adopt a new set of ceremonies. To directly answer your question, I'd be inclined to recommend Kanban for projects that are failing to meet delivery dates and running over budget. Scrum is a fine choice for more disciplined co-located teams working on new development efforts. Scrum also has the concept of architecture spikes to work out novel technical approaches that the team has not yet used to deliver some new functionality. Kanban can be an equally good choice for new development efforts, but is more suited to development efforts where the solution space technology is well known by the team. Both methods require product owner engagement to ensure that the work items are at the right granularity and that the backlog is always prioritized. I'd also recommend ATDD as a facet of both approaches. For the best of both worlds I'd recommend a Scrumban hybrid approach. Good point Huw. Since Kanban originated in lean manufacturing it tends to place emphasis on keeping new widgets coming out the back end of the assembly line. For the product in this case study, the technical architecture was already worked out. This particular project was about developing a ton of new custom functions on top of the existing frameworks, with some limited exceptions. So how do we deal with innovation? In Scrum, new technical approaches get worked out in architectural spikes if they are broad enough to cut across and enable the development of several stories, otherwise the new technical details just get worked out as part of the developing the story itself. In many ways, I think that Agile methods tend to gloss over the importance of good architectural design. My own feeling is that there is a need to spend time thinking about and designing the technical underpinnings of a system; you can't just haul off and start coding with no technical direction. In most cases, the team will pick existing frameworks to enable the architectural mechanisms of the system. It's less common that entire frameworks will need to be developed from scratch unless there is something particularly novel about the problem space that demands it. Either way, you still have to take the time to work that out before you start pulling new functionality onto the assembly line. In traditional methods, we tried to get all of the architecture details worked out up front before building anything. That caused us to eat up a lot of budget before having anything to show for it and resulted in solutions that were harder to adapt as we learned more during development. Either that or the design was just ignored in many cases. In Agile methods, I'd say that it makes sense to do enough architectural thinking about the top stories in the backlog that have some technical commonality. The stories that depend on getting those common technical bits worked out just wouldn't make their way onto the board until the dependency is resolved. While a subset of the team is focusing on throughput for getting that batch of stories developed, a smaller subset of the team can be working on identifying the next batch of stories that can benefit from some common components. This may result in some refactoring work. By the way, this was kind of the goal with the Elaboration phase of the Unified Process. The difference here is that you're working out architectural issues continuously on smaller batches of stories and only when you need to instead of trying to get it all worked out up front. Whether this technical work gets accounted for on the same board as the stories (functionality) or on a separate board all depends. Your idea of having an architectural assembly line that churns out technical components that stories on the functionality assembly line depend on is an interesting one. Thanks for your considered response, Steve. Yes, I agree about the glossing over of design. However, I think this is equally glossed over by binary distinctions of architecture and coding. Both lead to devaluation. I think it would be a different matter to take the pull metaphor seriously and track how a system's form ('architecture') responds to the "pulls" (assimilates and accommodates the content), which, as I understand it, would be closer to the original kanban spirit. Steve, I am not willing to offend you. However, from my experience, this story is just a dream, it is hard for me to believe. In my last project, was just similar as your situation, which had a lot of requirements from different sources, very heavy pressure, every team member had to work till late night every day. Then we thought, em, maybe Agile or Lean could save us. We tried to follow the practices just exactly as you did but did not see good changes. We applied Kanban, forced requirement analysts or delegates to prioritize all requirement in one backlog, hope every team member emerge good working spirit. 4) the worst thing was, the stakeholder kept asking for the plan, they wanted to know when the project could release. However, since transitting to Kanban, we normally did not (actually no capacity) work on a complete plan; that is, what we can provide was just a short-term plan which could be done in the coming couple of sprints but this was not accepted by the stakeholder. If we put more effort to do estimation on lower-priority stories, we may not even release anything in every sprint. So the long-term plan kept being unclear which made our stakeholder even more unhappy. I have to stop here. I can keep raise more issues we found during our practices. Let's think about this later. Thanks. Yes this is a real-world case. Scrum, Kanban, or any other methodology can save a project. It is a team's commitment to excellence and discipline with whatever methodology they select that determines a project's outcome. 1. Of course the backlog keeps changing. That's the reality of software projects, and that's how we keep ensuring we're giving users what is next most important to them. But once a work item is in progress the team has to be allowed to drive it to completion. 2. Project managers are not supposed to assign work to team members. Individual team members need to have the maturity and be proactive enough to pull work as their skills and capacity allows. If team members need to be told what to do they are either not being properly empowered. If they are being empowered but still not able to proactively pull work they need to be coached or replaced as appropriate. High performance teams cannot tolerate weak links, be they skill or attitudinally challenged. 3. If it’s really hard to understand what “done” means for a story then the story is probably poorly written or sized too large to being with. All backlog-based development approaches require effective articulation of work items. This only happens through lots of practice, but there are a few guidelines that all storywriters should follow such as the INVEST principles that will help to increase the understanding of what “done” means. 4. It’s not unreasonable for stakeholders to expect a plan. Just because you’re following an Agile method doesn’t mean you can’t do longer-term planning. It does mean you will need to set your client’s expectation that they don’t get to tell you what they want and when they want it by. They can tell you one of those. If you’re doing Kanban, you will quickly be able to establish your team’s throughput, which is analogous to velocity in Scrum. You can use that to forecast how many work items can be done in a timeframe. Clients may not be happy if you’re not telling them exactly what they want to hear, but in my experience, most clients are reasonable in terms of recalibrating expectations for the longer-term as long as the team predictably delivers on its short-term commitments. Point 1: I agree, business can change priorities as much as they like; but a given item in progress should not be interrupted and must allowed to be finished (exception to the rule: “items in the emergency lane” – remark: this lane should also have a WIP limit and is to be used exceptionally). Interrupting ongoing work results in known drawbacks (context switching, half-done work … in summary: waste).